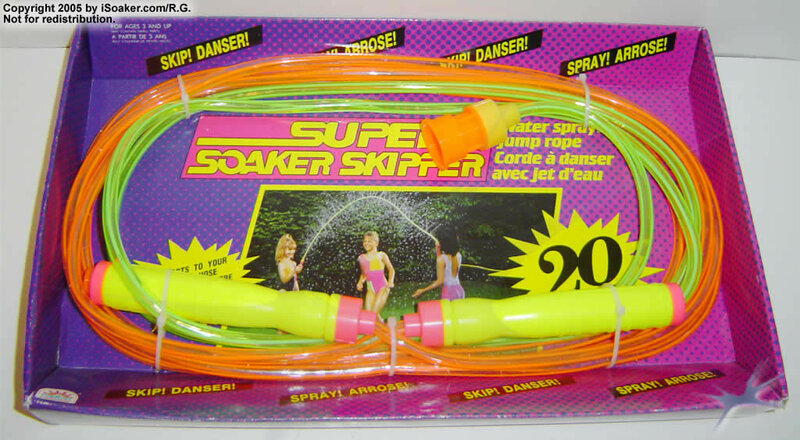 The Super Soaker Skipper is not a water blaster; rather, it is a hybrid between a skipping rope and a sprinkler. Attached to an active garden hose, the Super Soaker Skipper sprays water out along its length since the entire Super Soaker Skipper is perforated with many small holes. Its use in water warfare would simply be for base protection since an active hose is require for it to work. Only useful for base defense or for its original purpose: having a skipping rope that sprays both the skipper as well as those twirling the rope with water. Otherwise, the Super Soaker Skipper is more of a collectable as opposed to a useful water dispensing device. The only water-based skipping rope available. Not actually a water blaster. User gets wet when using this device. Skipping rope should be handled with some care to prevent it from breaking.